Born in Barcelona, Spain, Dr. Pablo Ouziel holds a six-month Post-Doctoral Fellowship with Dr. James Tully, working on a project titled “Towards democratic responses to the crisis of democracy in Spain: Forms of Participatory and Representative Civic Engagement”. 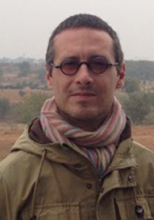 Pablo’s research interests include public philosophy, collective presences, horizontality, nonviolence and civic democracy. By standing within the tradition of public philosophy, the core of his work is centered on excavating networks of individuals governing themselves in numerous ways that supersede our current structures of representative government.